Home Odds and ends Happy Chuseok! It is that time of year again when the world comes together to celebrate Chuseok, the Korean thanksgiving holiday. The Korea Times today gave evidence of this, in the form of sales figures released by the Korean online mall, Gmarket. A Gmarket representative, speaking with the Korea Times said that a noticeable increase in foreign shoppers have, during the last six days, shown “…growing interest in Korean products that go on sale during Chuseok”. 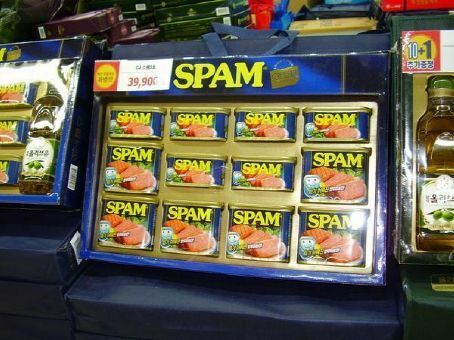 …because the only time you can buy a gift set of spam is Chuseok. Seasonal consumer trends such as this are not exclusive to Korea however. An extensive three-year study conducted by Cambridge University recently reported similar socio-cultural group behaviour among British consumers when it announced that a significant majority of Christians are more likely to buy Easter eggs in March than October. Shopping is however just a part of the ancient Korean Chuseok tradition. Many other important rituals are strictly observed during the holiday, such as flying to Hawaii (if you’re over 30 and single because you just can’t stand the annual Chuseok family harassment anymore). Anyway, whatever Korean highway you happen to be spending the majority of this week stuck on, may your Chuseok be joyous, and may the graves of your ancestors be clean and tidy ’til next year. 3 Comments on "Happy Chuseok!" Ha! This year was a record for people leaving the country at Chusok. Yay! Love the findings from the Cambridge University study. Yeah, they do good work!